It's been a while since I've gotten a new MAC product since I've started exploring lots of different brands. MAC has always been a favorite of mine because the quality of their products is never disappointing. Can I get an Amen MAC lovers :) I actually won a blog giveaway at Beauty Makeup Addict. Can you believe it? Lucky girl right! I never win anything. I got to chose an eyeshadow and a lipstick. Woohoo! It's such a shiny, glistening silvery shade that stands out with out being too glittery. I prefer to apply it foiled because the pigment shows 100 times better! It's the perfect accent to any smokey look. It didn't crease and lasted, with shadow primer as well, all day without a retouch. It went on smooth, unlike some shiny silver that can be gritty from glitter, and it blended easily. Above,you can see a subtle daytime smokey eye look I created. I added Idol Eyes from the lash line to the crease, and a grey shade, in the outer corner, from an e.l.f palette I have. I used a black Sephora liquid liner on the lash line, and FAIRYDROPS mascara. At $15 a piece, most MAC shadows come in small round flip top containers. Like I mentioned above, this shade looked silver in its package. I didn't really see too much of the violet mentioned in the description. 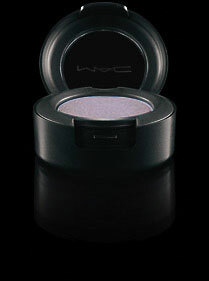 You can check out MAC's website for more details, or different shades available. Overall, I was super happy with this shade when applied foiled, which I don't mind doing if it gets a pigment like this! Applied the traditional way it didn't show up that well, maybe if I had built it up more it would have. The violet tint described didn't really show through either, which I was a bit bummed about. The fact that this shade would probably complement any color makes it so worth while. It's the perfect addition to any smokey eye! I've added it to bright teal and dark black smokey looks and it just brightens up the entire look, adding a wow factor. It was long wearing, crease free, and it's so pretty on. Thanks again, Beauty Makeup Addict for the awesome prizes! I don't own any mac eyeshadows, but i looove this color its very pretty, not too crazy or bold, yet a little bit more than the plain neutral colors! Great post!